WASHINGTON (AP) — The San Antonio Spurs are trying to become a better road team as they battle for position in the Western Conference playoffs. They made some strides against the Washington Wizards on Friday. 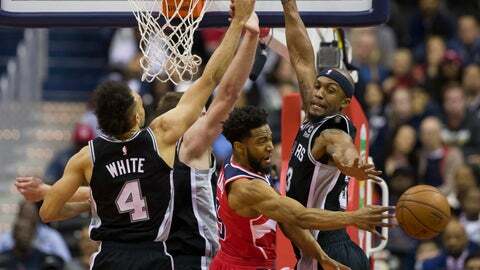 LaMarcus Aldridge scored 24 points, Rudy Gay added 18 and the Spurs beat the Wizards 129-112. San Antonio holds the eighth spot in the Western Conference, a half-game behind No. 7 Oklahoma City. If the Spurs finish eighth, they’ll likely play the defending NBA champion Golden State Warriors, who are currently in the West’s top spot. The Warriors eliminated the Spurs in the last two playoffs. Beal appreciates the Spurs’ excellence. Spurs: The 77 points in the first half were the most in a half since Nov. 7, 1990, when the Spurs scored 78 against Denver. … F/C Donatas Motiejunas, who signed on Thursday, had spent the last two seasons in China. He has played five seasons in the NBA, and was most recently with New Orleans in 2016-17. He scored two points in four minutes. … G Marco Belinelli, was out with left hip soreness. . Aldridge and DeRozan have scored more than 1,600 points this season, the first Spurs to so since Terry Cummings and David Robinson in 1989-90. Wizards: G Jordan McRae left the game with a sore left Achilles tendon. . F Jabari Parker missed the game with a sprained left knee. … F Trevor Ariza, who has a strained left groin, is not with the team for personal reasons, Brooks said. … F Jeff Green, who hadn’t played in the last four games because Brooks wanted to see other players, scored 14 points in 22 minutes. … The team waived F Wesley Johnson after the game. The Spurs’ final two regular season games are against two teams, Cleveland and Dallas, not going to the playoffs. Washington must win one of its last two games to avoid losing 50 games for the first time since 2012-13, when they were 29-53. Wizards: At New York Knicks on Sunday.